Diamonds and yellow gold earrings aren’t the only shiny accessories to make your look pop. White gold earrings are an unexpected twist to any look and classy types of earrings. Learn more about white gold jewelry and read on for our tips on how to style your new favorite gold shade. What’s The Difference between White Gold & Yellow Gold? White gold is an alloy made of yellow gold that is mixed with another metal and then layered with a coat of rhodium for its distinctive color. Yellow gold is mixed with different metals for more durability and to give it its lustrous color. If you are shopping for white gold, it is good to know that 14k white gold earrings have the same amount of gold as the same design in yellow gold. This is why there might not be a significant difference in price. One advantage of white gold jewelry is that it is easier to keep white gold shiny and smooth compared to yellow gold. When you go to polish your yellow gold pieces, some of the gold is brushed off too. With white gold this won’t happen. You can simply renew the coat of rhodium to have your white gold earrings shimmer as new. Bright and soft colored gemstones take center stage when placed in white gold. White gold serves as a lighter backdrop for colorful gemstones like jade and pink opals. Some diamonds can also come to their full potential in white gold. Diamonds that have a slight yellow coloring will seem clearer when set in white gold. If your favorite earrings are diamonds studs, consider a pair that is set in white gold. Or add a pop of color with drop earrings made of white gold and rubies. Nothing says glamour like diamonds. And white gold earrings are sure to make your diamonds sparkle. Take a lesson from Audrey Hepburn. When you are wearing an evening dress in one colour, you can be more elaborate in your accessories. Wear an intricate design of diamonds and white gold like chandelier earrings and carry this through in your necklace, ring and bracelet. If your dress is already fabulously extravagant, choose a simpler design in white gold earrings without gemstones. A single delicate dangling string of white gold gives a feminine touch to your dress. 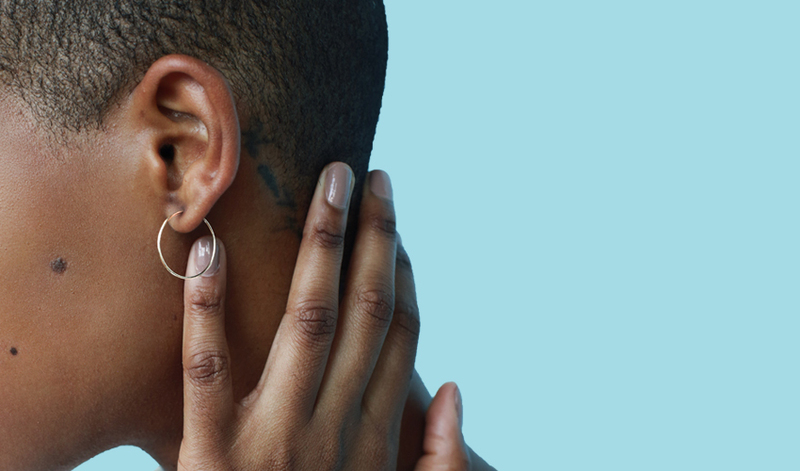 If you want to be feminine but with an edge, try threader earrings. 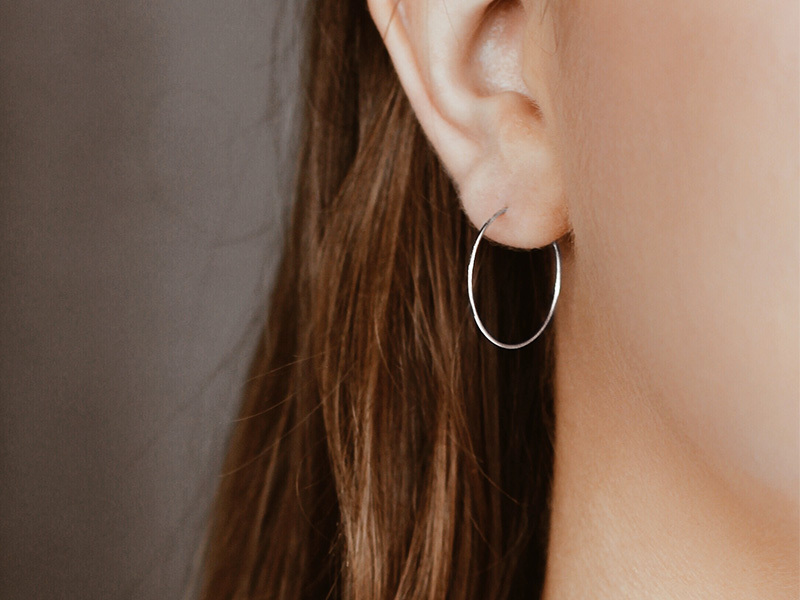 Few earrings are as versatile as hoop earrings. Imagine how much you can mix and match when all your hoop earrings are in white gold. 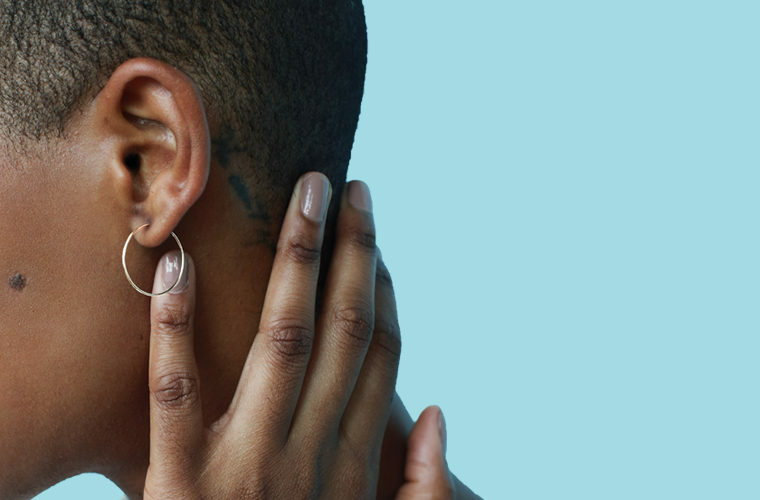 She shoots, she scores and wins the easy earring styling game. In the office, wear medium sized white gold hoop earrings, like the ones below by Ana Luisa. Keep it simple. No need to find white gold earrings with embellishments. If you have several piercings you can gradate the size of the hoops. You can also keep it clean by wearing one pair of hoop earrings and simple white gold studs for the other piercings. For a modern look, wear large or even oversized hoops with bold dark lips. Release your inner vamp with a deep purple lipstick and white gold earrings as wide as your cheeks. Tie back your hair in a sleek bun for a dramatic effect. If you are going for the boho chic style, go wild with your hoop earring design. White gold earrings work great with other colors so take that chance to stand out. Find a pair of hoops that jingle with colorful beads. There are also hoop earrings with an intricate design in its center, like the tree of life or an owl. Match the theme and colors with the rest of your accessories. Esmeralda will be envious. Simple geometric designs are trending in jewelry. Find white gold earrings with a strong and minimalist design to give any outfit an extra edge. Think of straight line shapes like bars, triangles and squares. Geometric minimalism does not mean monotone. You can play around with different shapes to create an interesting pattern. For example, mix a creeper earring of tiny triangles with bar-through-hoop white gold earrings. Then, have the bars and triangles come back in your other piercings as studs. Continue the geometric shapes in a pendant necklace or knuckle ring. If you want to try something different than silver but yellow gold is not your shade, welcome white gold earrings into your life. Their color isn’t limited to any style. White gold earrings can be the signature of luxury when you want to feel classy. They can also be the cool edge your outfit needs to be complete. Click through our other articles for more gold jewelry tips. Don’t forget to check out Ana Luisa’s fabulous white gold jewelry collection where you will discover amazing white gold hoops.